1340 N 29th Dr (top) and 40 W Hoover (bottom) were sold as a property investment opportunity. 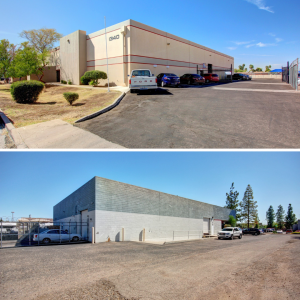 Menlo Group negotiated the sale of two industrial warehouse buildings, located in Phoenix and Mesa, Ariz.
Tempe, AZ, February 11, 2019 — Menlo Group Commercial Real Estate has announced the sale of two industrial warehouse buildings. The buildings are located at 1340 N. 29th Dr., Phoenix, Ariz. and 40 W. Hoover Ave., Mesa, Ariz. The locations total over 33,000 sq. ft. and are currently leased by the same long-term tenant. 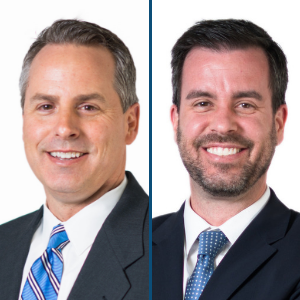 Menlo Group President Tanner Milne, MBA, CCIM, SIOR, and Vice President Tom Ellixson represented the seller throughout the transaction. Before leasing out the space, the seller had occupied the two properties for many years. 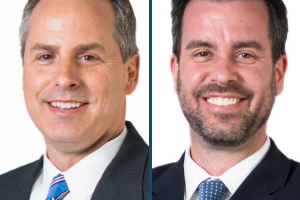 The buyer, SIP Acquisitions, was represented by Matt McDougall, SIOR, of Lee & Associates. Menlo Group is a full-service commercial real estate brokerage that specializes in the medical, dental, professional office, childcare, industrial and property investment markets in the Phoenix metropolitan area. Through its unique processes, Menlo Group illuminates the path to success for each client. To learn more about Menlo Group’s industrial and investment services, visit www.menlocre.com.